Winter Weather and Wild Wind! The cold weather has arrived…. Last week I got wet during two runs, this week I froze! It has certainly been a quick smart kick into the winter weather. On Thursday I ran a 16km loop with 11km at marathon pace. it was a bit drizzly at the start of the day, but when it came time for me to head out, it had cleared somewhat. The temperatures was a bit cold however so I donned my running vest to keep my core warm, and popped on my beanie….first time this year. It was a pretty grey day, but in the distance the sun was trying to come out. As I was running along it finally made an appearance, but it was not for long. A big, black cloud started to roll in and just when I was in the final 5km of my run, it just started pelting down and I arrived back at my start point totally soaked. Sunday was my long run, 32km. Luckily the weather was fine, as rain had been predicted and so I didn’t get wet. I did however, have to employ all sorts of self motivational techniques to keep me going past the 2hr 30min mark. That seems to be my sticking point, and although I drink water and eat my gels, I still flag at that point. I was using my arms a lot, pumping them in time to my breathing and that seemed to keep me going. I know it’s all in my head, as when I know the end of the run is coming, I have energy enough to speed up and charge to the finish. The mind is an amazing thing! Actually I just read an article about exactly that which said that we can all actually run faster, harder, longer etc., it’s just that our brains tell our bodies we can’t do it. Kind of a self preservation thing. I guess it’s only bad when your brain works so well all you do is sit on the couch! And so we come to today, still freezing, but no wind, so no excuses this time. I did my strength workout and headed out for an easy 6km trot. It was only 3 deg C when I left and it felt like my face was going to fall off, and I ran too fast because it was cold and I wanted to get back home quickly. But I did it and that’s all that matters as the GC Marathon is only 5 1/2 weeks away and that’s not really very long! This is why we are so cold! 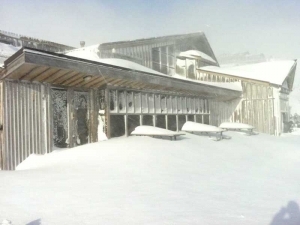 Taken yesterday, the ski fields are all happy with the dumping of snow! I am in a quandary. It seems I may have a teeny umbilical hernia. This is definitely NOT part of my planned lead up to the GC Marathon! On Tuesday evening I got up from watching TV and noticed a tender area just below my belly button. There was a small lump there and my hubby suggested it may be a hernia. My brain refused to accept this and so I decided to wait until today to see if it went away. This is typical of me as I am not one to go screaming and yelling to the doctor at the slightest, or even more serious, sniffle or twinge. I prefer to see if my body will heal itself, as it should. Anyway, I continued with my training on Wednesday and come yesterday morning as I was heading out for my 16km run, my friend also suggested it may be a hernia. So after my run I succumbed and rang the doctor and got an appointment for that evening. And so she also suggested it may be a very small hernia (it really is less than the size of a pea) and has written me a referral to the specialist. So now I wait for an appointment. In the interim, my doctor thinks its fine that I continue to run, as she knows I am training for the GC, but I am now worried I may do more damage by doing this. I have a long 32km run on Sunday coming up and I don’t want to miss it. I also don’t want to make myself worse! And all this is whizzing around in my head as it is not a confirmed diagnosis yet. So today I am in a quandary, which is possibly why I am procrastinating with doing my workout for today (strength and 6km easy run) as I am not sure if it is a good idea. I don’t normally post two days in a row but today’s experience warranted a write up! Today’s training session called for 14km with 4 x Yasso 800’s. The training plan I am following came out of the Runner’s World magazine, and has instructions for each type of run. I have never done Yasso 800’s before, or any kind of Yasso anything, so this was all new to me. 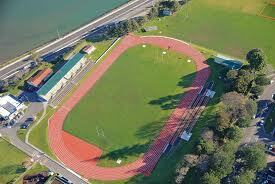 I realised I would have to go to a track, luckily we have a very nice one, thank you, here in Tauranga. I realised as well that doing 4 of these Yasso 800’s meant I had to run 4.8km around and around the track. Given my boredom scale of repetitive running, I was a bit worried. The second thing that worried me was that I had to complete 2 loops of said track in 4.30 mins, as I had to run at my marathon time (I am planning a 4 1/2 hr marathon). Regardless, I am the sort of person who will complete a training programme almost to the letter, and it is only severe illness or perhaps loss of a limb that would stop me from doing what I have to. So I set out to do the biggest part of the run around the Waikareao Estuary (you can see the water in the photo of the track). As I trotted around I continued to feel a bit worried about my ability to complete these Yasso 800’s after running for about 8km first…at least my foot was feeling okay. The best part about today’s training session was that I really enjoyed running around the track, it was something different. As I jogged back to my car I felt happy and satisfied with a job well done. The cherry on top was bumping into my hubby and going to the cafe for a coffee and a bite to eat. So even though today was one of those grey, cold days, I didn’t even notice! How fantastic is that! I think I am getting the hang of this new breathing technique, although I still find myself reverting back to my old way when I totally zone out. Today I tried using the count of 10 and that seemed to work better. In for 1-2-3, out 4-5, in 6-7-8 and out 9-10. I am also finding I have started to run a bit faster, well quite a lot faster, and I am wondering if this has to do with this new way of breathing. Supposedly, it is supposed to have an impact on your speed. There is a little over 7 weeks to go until the GC Marathon now, and this coming Sunday I do the first of the 30km+ runs scheduled in my training programme. I am both excited and looking at it with some trepidation as this run will be done on my new shoes that have the 4mm heel-toe offset, a lot lower than what I ran my first marathon in. I am sure it will be okay, seeing as I have been slowly coming down from the traditional running shoe height. Next thing I need to do is buy a second pair as I am rotating with the old 8mm ones at present, not so good…. The other reason I am feeling a little trepidation for my long run on Sunday is that the weather forecast is for rain, and I am not such an “in the rain” runner. I like coolish, sunny weather for running, but then I guess that’s most of us runners! It’s one of those autumn days when the weather changes about 52 times in an hour – sun, grey, rain, sun, grey, rain etc etc. I don’t do well with the grey bit, so the whole day I have been feeling happy, feeling grey, feeling happy, feeling grey, until I nearly drove myself silly! So I decided to do something positive, I cleared out my old financial/tax records prior to seven years ago. Doing this made me feel quite light, whether it was the activity of sorting through stuff and physically tearing papers to shreds, or just the fact that I was getting rid of things. Throwing out stuff always makes me feel lighter. I did go for my training run this morning, 11km with 6km at marathon pace. The sun was out for most of my run and it made me feel energised, as doing some physical activity, especially in the sun, always does. But I find that for whatever reason, the feeling is not very long lived if the day is grey, and I soon find myself feeling grey and grumping about the place. Perhaps it’s because I am originally from Africa where it is warmer and sunnier for more of the year. I can remember having these feelings during winter over there, but that grey part of winter was never very long. I guess in the cavemen times, people naturally slowed down and did less in the colder months, and these days we are expected to carry on regardless. Perhaps that’s why the medical world has coined all these new ailments, like SAD. Perhaps we are not SAD but just in tune with the seasons and having an inner conflict with what is expected of us in this modern world. It leaves me wondering if I should slow down in the colder seasons, rest more and let my body rejuvenate for the spring. But that would mean no long races during winter or spring as I wouldn’t be able to put in the training needed to accomplish those goals. This year I have committed to the GC Marathon in July, so I shall soldier on, but perhaps next year, just perhaps, I may schedule my running training a little differently. It has been an eventful week, both running and just as a family. Not in a negative way though. My youngest daughter has been home from Uni for two weeks (we dropped her off back in Auckland yesterday) and my husband had a further check up with his specialist about his hip. It was great having my daughter home, and her cat was extremely happy as the two cats we have don’t really get on, so when she’s not here the other one mopes a bit. My husband is happy too, as he is now able to drive again, which makes me happy as I don’t have to a) take him everywhere and b) have him going on about my driving….. In amongst all of this going on, I have been learning a new breathing technique which I read about in a recent issue of Runner’s World magazine. Basically it meant that I had to unlearn my previous breathing pattern of inhale for 2, out for three, 2:2 as I got faster, and 3:3 for easy runs, and start breathing in for 3 and out for 2, or 2:1, or the hardest (and I still can’t get this) 2:1:1:1. Anyway, this is too complicated to explain it all so you can read about it here. Needless to say, I have definitely noticed a difference, although it is very east to fall into my old pattern as I get tired. Which I certainly did yesterday. My training for the GC Marathon has been going well to a point. I say this because I realised last week that I have been running really slowly. So I ramped it up on my 11km midweek run last week and it felt really good. Then I looked at my training schedule and realised slow was what I was supposed to have been doing, up until this week, as I was working on strength and not speed until now. Speed starts tomorrow! I find it quite amazing that I subconsciously felt it was time to go faster, even if I preempted it by a week. Maybe there’s something to be said in waiting a little longer, and I can be impatient, but then listening to your body is something I have been going on about for a while. And this leads me back to getting tired yesterday. My long run was for 26km and seeing as we were away I decided to run from Colville to Cor0mandel. 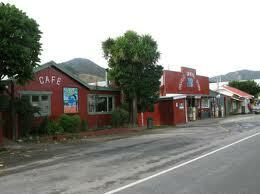 That’s a picture of the cafe and general store. The cafe is fantastic, called The Green Snapper, and if you’re ever up there you must pop in. 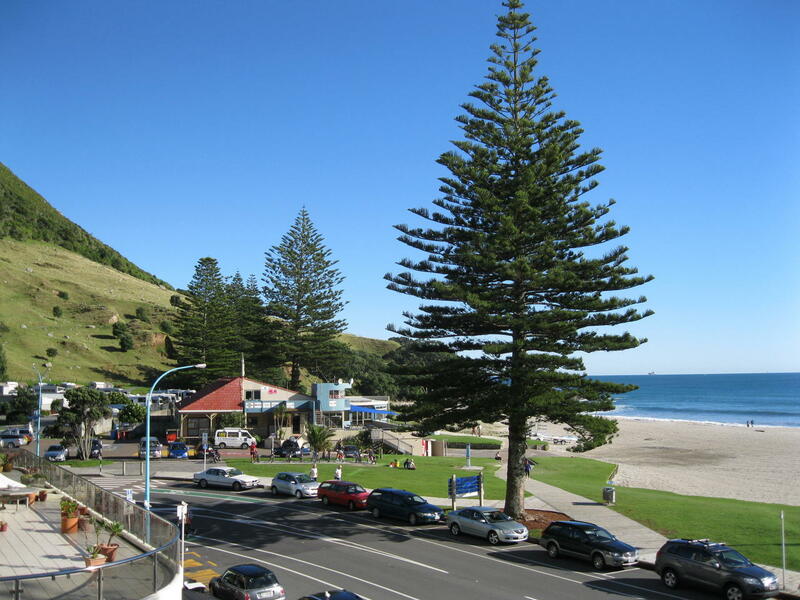 We went up to the bach for the weekend on the way to take my daughter back to Auckland. I logged my run on MapMyRun and you can see it here. It takes in three enormous hills that climb forever (well it felt like it to me!) and so I listened to my energy levels and walked when I needed to. It rained a bit on the way, nothing too bad, which was lucky as the prediction was for wild weather! I have decided that it is my last hilly long run now, as the strength phase of my training is done, and now I am going more for endurance and speed. The GC is a flat race and there’s nothing like the principle of specificity. Train flat for a flat race, and I plan to get in under 4:30 this time! Anyway, to get back to the breathing….I have found that done properly, this new technique has definitely helped me to feel more comfortable and dare I say it….faster. Watch this space! Today I went for my final hill run in this training schedule. From next week I will be doing hill repeats and ten km repeats as well as some Yasso 800s. I am looking forward to not doing the long hill runs…..they tire me out. I got back today, ate something and gradually felt sleepier and sleepier as the day went on. I did push it a bit though, as last week I seemed to have run really slowly, and I need to up the ante for the race. Anyway, I digress…. Our neighbours ones are very badly behaved, they howl, bark, chase you in the street, wander around and crap everywhere, chase my cats on our property,they are generally a nuisance. We have repeatedly rung the council to complain about them, letters have been sent, warnings issued, owners physically spoken to…..none of which has worked very well. We have given up and I have vowed to drop kick either of them if they come near me or my cats again. Now don’t get me wrong, I actually like dogs, but these dogs are different. 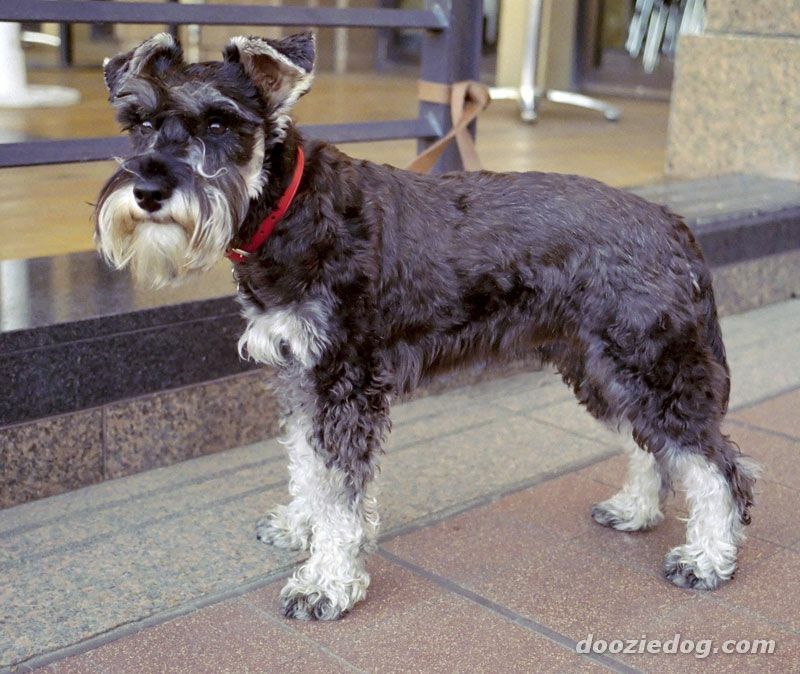 While out running I have often come across people walking these schnauzer dogs. I have noticed three things about them. Firstly they always seem to come in pairs. Secondly, one of them always seem to make a rush at you. Thirdly, the owners often seem to like walking them without a lead. And so we get to today….the lady in question had two schnauzers off leads, one of which made a dash at me while I was running past. I passed her twice, so it happened twice. I did not hear her call to her dogs, I did not hear her apologise for their behaviour, I did not see any leads. I have a real problem with all of this. I am on a public walking path, council bylaws say a dog should be under control in public. This is not under control. When a dog rushes at you, you have no idea if it is about to take a chunk out of your ankle or if it is merely being nosy. The owner may know, but you do not. What on earth goes through their brains to not even call their dog to heel when their are other people about. Or put it on a lead if it has self control issues? I did not get bitten thank goodness, but I did nearly trip over the dog twice, and shouted some choice expletives over my shoulder at the owner, which felt quite good. I really think dog owners should think a little about sharing of the pathways….we do not want your dog rushing up to us, we do not want to be tripping over a lead 5 kilometers long. Keep your dog under control please…oh! And yes! Pick up after it!